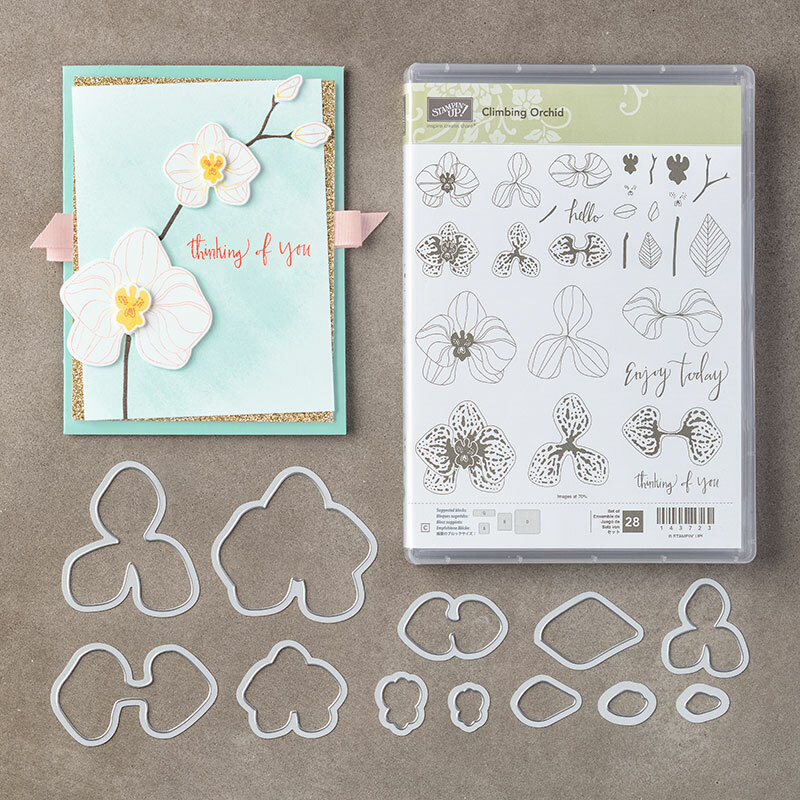 Climbing Orchid Bundle, Stampin’ Up! Find the Colors. Are you able to distinguish the various colors on this card? The three colors are accented with Early Espresso (from the cardstock used to crop the Seasonal Layers branch) and Very Vanilla (from the Spooky Night Designer Series Paper panel and cardstock layers) and . That’s right! The background of this beautiful card is from a spooky Halloween-themed pack of papers. Here’s a look at the colors and patterns in Spooky Night Designer Series Paper: Just for fun, I thought I’d list the places where each of the colors is used. Stampin’ Blends – November 1. Stampin’ Up! has released a new set of alcohol markers to demonstrators – they will be available to customers starting November 1. I couldn’t be more excited – I’ve used these Stampin’ Blends on so many projects since I first received the new markers! The alcohol markers (offered in a dark and light shade of select colors) are so easy to use – they give such a uniform wash of color (with one marker) or beautiful depth and texture (with more than one color). With nestable, press-fit lids, these markers are designed to stay sealed so the markers stay inky long-term. I used the Pumpkin Pie Stampin’ Blends on this beautiful orchid and then reached for the Color Lifter to strategically pull away some of the color on the petals – it helped to lighten things up a bit. SO easy! Great interpretation of this week’s challenge. Love the colors too. This is definitely a WOW card! I would never have put the two oranges together but they work beautifully. I think of the whole combination as a Halloween combination, but you proved me very wrong! I love this card. Great take on the color combo challenge, Brian. I would not have chosen those colors on my own, but they work great together. The background DSP really grounds the pretty orchid. Great job! Enjoy your day! Thanks so much, HJ! I really appreciate that feedback. I loved working with these colors far more than I expected. Wow! These colors steal my heart and I love how you used the designer paper in a “non-Halloween” way! Thanks, Mary! I was initially concerned the paper might be “too much” but I think it was “just right.” Always love to hear from you! I love the two oranges as well. I would not have paired them so thank you for the inspiration! Beautiful card! Isn’t this a fun combination? Were it not for the challenge, I likely wouldn’t have reached for Tangerine Tango. Thanks, Michelle! Love this card, this stamp set is just so beautiful, this images are so true to the real flowers, I love it. And this combination of colors is so very Halloweeny but you stepped out of this mood and created something totally opposite. I must confess that when I saw this colors Halloween just popped in my mind, perhaps it’s because it’s almost here but you created something totally different and I love it. Thanks so much, Maria! I almost always try to step away from the “intended” use for colors with these challenges. This flower was my starting point, so I knew I’d have to pull FAR away from Halloween. However, as a fan of the Exploding Kittens game, I just realized you could cut off the top of the H and make it a NOPE card! 😀 I can think of lots of situations that call for a nope card. NOPE. That’s perfect. Thanks so much for your comments! Any chance you are bringing Exploding Kittens to SLC? Burst of beauty ! What a color combo discovery ! So so different ! Orchids and orange variations ….plus a shot of exotic Fig ! WHOA ! Thanks so much, Sonny! I really enjoyed playing with these colors. It felt like a challenge at first, but they worked together beautifully. I love how you used the Halloween DSP for a definitely non-Halloween card. I also think pairing the Tangerine Tango and Pumpkin Pie can be tricky but you managed quite successfully! It helped that this paper started out as a versatile page. I am still using it for my Halloween projects, though. 🙂 Thanks, Dianne! Wow, I’m surprised that I like the two oranges together. Nicely done! Right?! It’s likely best to keep one as “an accent” – but they work together beautifully. Thanks! GORGEOUS! Brian, I never would have thought of those colors together. Love how you played these colors and your coloring on the flowers…you do this set justice each time you use it! Thanks so much, Robbye! I’m so happy you like the card – these colors are great! I looked at the color combo and thought eeeeewwwww! Then I looked at your card and thought WOW! You ARE amazing! Same here. I almost felt punished by having to make something with these colors, but I had lots of fun. The Design Team cards are wonderful, too! Thanks, Grace! It is a rare man who sees differences in color families! My ex used to ask me to wear my “red dress” but I didn’t have one! It was fuschia but to him it was red. I never would have thought to use orange for orchids but this is striking. I can see the color differences too and why one just serves to accent the other. Beautiful job. Thanks so much, Nancy! I have always enjoyed colors – I don’t switch things up with my wardrobe (mostly just blue shirts), but I have love colors. So glad you like my card. Thanks! This is such an awesome card! I love bright colors, so this scheme is right up my ally. I would have immediately thought of Halloween for these colors, especially at this time of year, but I like that you rebelled against the expected (probably because I’m a rebel, too). This is so creative and inspiring! You and I are such rebels, Natalie! I really enjoyed the challenge of a non-Halloween card with these colors – so glad you like my card. It’s always nice to hear from you. Thanks so much, Frenchie! I’m so glad you like my card and am so happy for your family. Much love to you, friend. This is simply GORGEOUS, Brian! One of my favorites of the many cards you’ve posted. ? Wow! This card is stunning, Brian. Love it! Thanks for sharing your amazing design talent with all of us. 🙂 Thank you so much, Becky! I really appreciate your kind words – so glad you like the card.